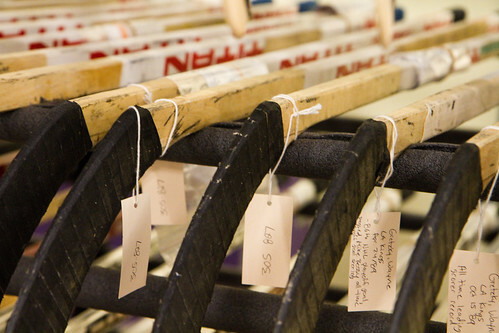 The collection of hockey sticks was impressive, there was no denying that. There must have been thousands of them. Modern composite sticks from last year, ancient hand-carved tree branches from the dawn of ice hockey, and everything in between. Almost all of them showed signs of extensive use. I walked along the racks and stopped in front of a huge number of red-and-white Titans. I found the repetition appealing. “Do you know why we have those?” Craig asked. I thought about it for a moment, but my knowledge about the history of hockey was narrow at best. I shook my head no. I am not the person you want on your hockey trivia team. “Take a look at the labels,” said Steve. I chose one of the sticks at random and leaned in close. “Gretzky, Wayne” read the tag. They were Wayne Gretzky’s old sticks. Scores of them. I was impressed, much as I had been throughout the previous hour. 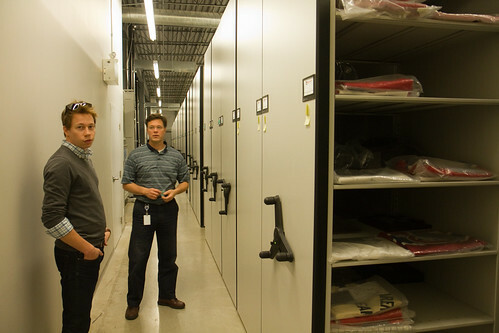 Craig and Steve were giving me a rare behind-the-scenes tour of the Hockey Hall of Fame Resource Centre in Toronto. Tucked away in a rink complex west of downtown Toronto, the Resource Centre housed the Hockey Hall of Fame’s artifacts and archives. I had been to the main Hockey Hall of Fame in downtown Toronto earlier in the day, and while it was neat to see things like the Stanley Cup, the Vezina trophy, and the recreation of the Habs dressing room, I found the tour at the archives to be much more interesting. For one thing, the relics were right there in front of me rather than behind glass, so they felt far more real. For another, I got to see the passion of the people behind the hall of fame and the archive — they seemed genuinely passionate about their jobs. I came to be at the Resource Centre via Steve. Steve had read about my trip on Puck Daddy and, in addition to setting me up with a game in Toronto, he arranged a meeting with Craig, the manager of the Resource Centre. Steve had that connection because of his role as sports editor at Firefly Books, which does the Hockey Hall of Fame books. Conveniently, both Steve and Craig were goalies, something evidenced by Steve’s recent book, the Hockey Hall of Fame Book of Goalies, in which you can see his passion for the history and development of the position. Those big movable shelves are full of hockey history. Steve is on the left, and Craig is on the right. At the end of the tour, I chatted for a little while with Craig. He reminded me that the Hockey Hall of Fame Resource Centre aims to document the game as a whole, not just the exploits of NHL stars. Notability, Craig said, can come in many forms. Had he ever heard of a trip like mine, I asked? No, he replied, to the best of his knowledge, an such a journey has never been done before at any level of play. I would likely be the first. Given the unique place your trip holds in hockey history, will you be donating an artifact to the HHOF? @Scott Perhaps. If I did, I doubt it would ever see the light of day in the main HHOF, but it would still be kind of neat to know that something of mine was in the archives. We’ll see.